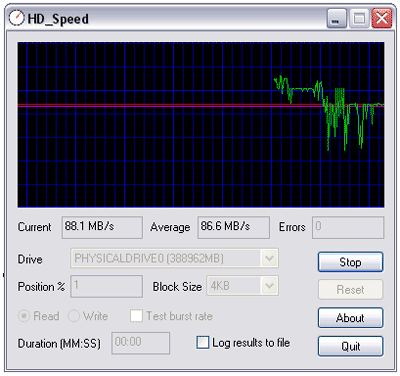 HD Speed is a portable utility that can measure the burst speed or sustained data transfer rates of your CD-DVD roms, hard disks, and floppy drives. HD Speed presents this data via a nice clean and simple GUI. This application can be installed to and run directly from a portable device such as a USB flash pen drive. Note: https://virusscan.jotti.org/ found Win32/Heur in HD_Speed via AVG. This detection may be a false positive, however we have removed the download link until the file can be validated.